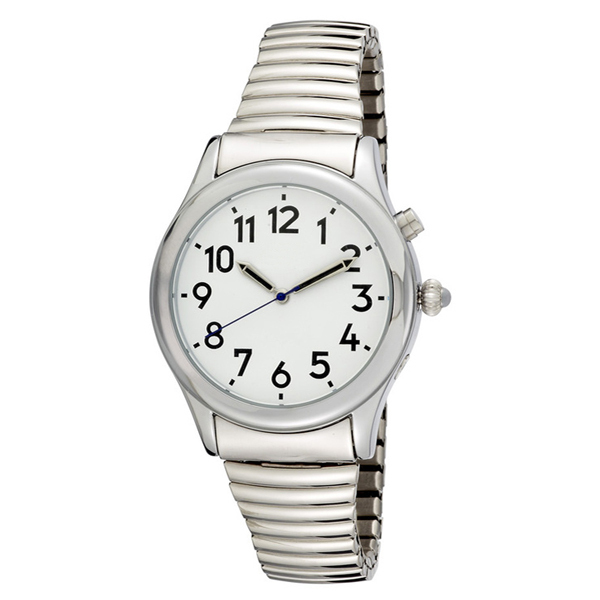 This is a true quality and elegant looking Ladies Silver tone talking watch. While it has only one button, this watch announces the Time, Day and Date, Year, and has an Alarm. Very simple to set and even easier to use. The design is stylish so the flex band is tapered and the crown has a beautiful oversized pumpkin crown with cabochon. The font can be easily read by most. To change the voice, hold the button located at the 2 o'clock position for five sections or until the voice changes. To hear the time, push the button at the 2 o'clock position one time. To hear the Date and Year push the same button again.